John: How would you describe the "DP" sound to someone who has never heard your bands material? John: Tell us about your last release "VOYAGE". Zuzana: Our 2nd full-length album contains 11 songs. The composing of this material has been going on for two years and Standa and I came up with various musical themes. In winter we got prepared intensively, we had important pre-production recording sessions in a studio. We had to redo some material, especially arrangements. We set up with the great help of Milos Dodo Dolezal, by the way owner of studio and good experienced musician, who did mastering too. Our friend Karel, who played the violin on Secretly album and some live gigs afterwards, had written for us two great song and we’re glad to enlarge our repertoire. He also helped us a lot with recording, not only with vocals, he also played the piano and tum-tum drums on the album. In March 2002 we’re ready to start to record it. We had just two week to do complete recording, mix, mastering. Well I think, in such a short time, we managed to do good album. Final mastering on the album was done in April. And later on VOYAGE was successfully released on time on May 17th 2002 under our label Metal Breath. Next day was christened properly at Ultra Doom Party in Rafanda club. John: Who came up with name of the band and by what means? John: With 11 tracks of fresh material on the new cd, did this amount of music come easy for the band to write, or did it require extra effort on everyone's part? Zuzana: Sometimes composing and training goes extra quickly, especially if we are on the same frequency, sometimes it takes much longer. We do not play complicated music with many breaks, however we are six people and it takes some time to find out best form, we discuss a lot and make many compromises. We have not been in time press or anything like this. If someone has a new idea, just brought it to the rehearsal and we start to play it. It is usually Standa or me, who brings the music ideas to the band, then we all together adding rest of instruments. I think that we haven’t refused any song Standa or me brought, just transform little bit to our DP common taste. Zuzana: I have always loved to sing. I was attending children choir for about 10 years and it was a good start. Well, I don’t have any secret therapy or anything like this. It’s necessary to train the voice - sing properly. You can’t feel any tension in throat, not overstrain the voice. Try to keep up or avoid smoking much (I don’t). That’s all. I’m trying to learn more tricks and technical skills. It comes out from me naturally. I prefer to improvise and use my voice spontaneously. John: With the incorporation of Veronika and her dazzling flutist ability into your bands sound...Do you think perhaps you may have found your own distinct sound and or niche? Zuzana: Flute is a big part in DP and makes many beautiful melodies. I love the sound, it lighten our music. Actually this instrument come later, as I remember in 1998, originally we had keyboards like most of the bands. We had changed whole music and many melodies we transfer to flute solo parts. Lately the problem is Veronika’s not very involved. She study law at the university and we meet each other only on concerts. Which is very seldom at the present. Unfortunately we cannot work like this, musically we want to go on, we compose a new material, so I’m afraid flute will have only small parts. John: What would you like to see happen to consider 2003 a success? Zuzana: We play a lot, it’s important to show audience our great potential - live concerts. We played on some summer open-air festivals last year as well as this year. We mostly play on metal and hard music fests, I 'm certain we can break through as well in rock festival, e.g. we had confirmed one of the biggest Czech rock festival in TRUTNOV OPEN-AIR. We’ve been touring over Czech republic every year, not bad, really. I haven’t counted it yet, but we had many concerts so far and it will make our live shows more professional. Then we will have the courage to hit some foreign stages. And we sold many copies of our album, as I can read from auspicious reviews and fan responds, our VOYAGE is quite successful. John: How is the metal/music scene in your native Czech Republic? Support for DP?? Are you seeing a rise in femme fronted metal bands in your hometown? Zuzana: In our hometown, we are the only metal representative. So let’s focus on how is the situation in Czech Republic. Our country isn’t large, everyone knows everyone, and we meet with another relied bands on concerts and festivals, trying to help each other somehow, trade stuff and concerts. There is always time to have a drink, to discuss all subjects and summarize. 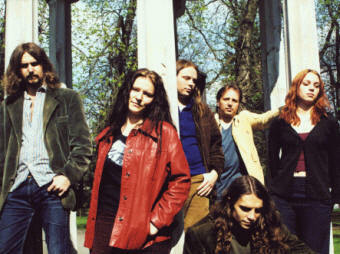 Large percent of them play in more bands and projects, generally I can say here’re many bands and just few musician. Some guys support the scene by making u/g magazines or net-zines etc. On the other hand, except this positive underground relationships, unfortunately there are always some weird people, rivals, I call it dark side of the underground, that do not accept your success (even in our case) and see it black and white way, they forward bad gossip about you and trying to put you down. Many fans stopped to buy CDs, it troubles many bands, they just copy illegally everything they have in hands, no matter how much it costs. Not much clever. Under these circumstances the small labels are having a bad times to survive. And their stable bands as well. Underground represents minority. It is some strange way of insanity and devotion to stay in this adverse position. In metal scene we have just a few solid underground labels to keep supporting independent artists, thanks to them we can release our music. Unfortunately it is not comparative like in Western parts of Europe, there is a strong support from labels and band can get more prosperous condition for their creativity. For some strange reason Czech bands are obviously still overlooking, I wish I knew why. What is most sad, metal scene is overlooking even in our homeland and I know pretty good guys here that could easily break through. Czech music has characteristic sound and moods. I don't know, I believe the situation will be better when our country will be part of European Union... it will be soon. In fact there are many women in music, even in heavy music, but I have heard only a few worth to listen. I feel respect from my colleagues, musicians, which is good. John: DP seem to have seriousness to their lyric writing, what messages are predominant in your thoughts when you get creative and write lyrics for music? Zuzana: Usually Standa writes lyrics, because he’s main composer too. One friend of ours Tom Braxatoris has written few quite depressive texts, they fitted perfectly to our mood. Seldom I do. Generally DP lyrics are about ordinary world, about live and death, emotions, dreams, feelings, various social and philosophical themes people often contemplate. Music is marvelous resource to express emotions, so our lyrics correspond with music we do. My lyrics reflect state of mind in each period of time I was. No mysteries, mythology or vampires. John: If there is something that you have not been able to do to increase your chances for major recognition what would it be? Zuzana: That’s our dreams ... sometimes dreams come true. Talent is one thing, to have luck the other. Maybe I don’t know particular important persons ... We would be more then happy if some of the biggest labels will choose us for the music we play. Then I will feel proud if I will play on big festival all over the world. What I’m sure we don’t want to turn upside down our music style to impose to contemporary music taste for being successful. That’s crap. John: Tell us a little bit about the video track available on the new CD...This is not your typical video and is also a track from your last release "Secretly"...Also interesting as song/video is a remix and unlike the song released earlier. Zuzana: Everything was link to each other without any special effort from our side. First idea was when Petr Neubauer - studio engineer known as VR:24, who we had worked with on our Secretly and VOYAGE album, had made a jungle remix of instrumental "Nightfall". He makes electronic dance music. By the way I agreed to cooperate with him on his new album, he had released this year and I appeared in one song called “Grayness”. We help each other. Then one of our friends, who studies film directing, offered us to make a video. He had equipment and intention to do it. Then we realize that it could be good idea to make something untypical, something new. And cheap of course, because we still have to pay regard on money. In fact we left him free hand. The video clip is all his work. Why we had to have a main role in it? After all we managed to provide interesting clip for free. Good work, guys. Now we have a new clip from the same director, we chose song “Hot Breath of Night” from our latest album VOYAGE. You can download it on our websites. John: Do you see a USA tour as a possibility any time soon, if not how extensive will your touring be in support of the new CD? Zuzana: I‘m very sorry to disappoint all potential American fans, but at the moment we don’t plan any tour. We are not signed in any agency. In some way we are looking for some, which will take care of us. Our label do mostly promotion and cannot afford to pay air tickets and hotel etc. I am not sufficient to manage it alone, so our concert possibilities are limited just for our country and Slovak. I have some contacts with bands, which we could trade a gig in the future, we would invite them and they do the same. ATTENTION!!! That’s our call to all promoters and bands!!! If there is anyone who’s interested organize concert or trade gig, do not hesitate to contact us!!! We play a lot here in Czech republic, as we promote ourselves nationwide. We won’t leave the chance to support some famous band. We did it only once, in Prague, we support The Gathering on their tour in 2001. That’s great deal of success. So I believe we could have many fans in States or Mexico, so far we’ve received many nice responds. We’ll see. We make big plans to tour more with our next album. John: I noticed a drop in your lyrical contributions on the latest release? Is there a reason, or is it growth on the other members behalf? Zuzana: It’s very personal to me to write down something, if you know that somebody else will read it. It is very intimate to me and I don’t like to do it often. Maybe I had less time or I didn’t feel like to write more. Important for me is to have special atmosphere, appropriate afflux of creativity in which I am able to work. And I must confess it doesn’t happen to me, maybe intentionally, often. I’m not very ambitious with writing lyrics, Standa is more open and actualize himself more. It’s fine this way. John: What is your DYING PASSION? Zuzana: Who knows? I’m not tell you. John: Favorite Venue to play Live? Zuzana: Rafanda club. Absolutely. There's a great atmosphere, this is more like our home stage. I can say there’s everything (almost everything) under control, like program, sound, lights etc. because we‘ve been doing this metal events for three years, since our first release of No Time demo CD and as I remember it was 15 concerts so far. It’s going to be better and better if fans will keep going. John: Dream Venue to play live? Zuzana: Well, first I have on my mind is to support Type ‘O Negative here in Prague in July, it would be great. Then I really think of big European tour, I mean anywhere abroad, to introduce our music wide audience. I'm afraid it's pretty hard to undertake it without agency or label support as I have mentioned before. I believe our music could be popular anywhere, it could be marvelous undertake a VOYAGE (with VOYAGE) over the sea, ‘cause we have many fans in Southern America and Mexico. I think it could be good adventure as well. I’ve been only once in America, in NYC two years ago to visit my sister and her husband. And I love traveling. John: Favorite Private Place or Vacation place? Zuzana: I really don’t know. If I say that every our song is piece of my heart, I would lie ....I look on it more critical way then the other... Currently I prefer to compose and perform new song, there are not finally done. No one heard them so far, we’re still trying to find out best form. We want to play two of them live on summer festivals. They perfectly fits on live concert. Well, my favorite songs from last album VOYAGE are slow ballads Microcosmos and Severance. John: Thing you find hardest to do and have to work at. Zuzana: Well, let me think. This is not easy to say. I’m very impatient. Sometimes I’m very nervous and I realize I can be very naughty girl. I could be more ambitious and responsible. I’m very lazy and I hate it. I don’t like to do things when somebody told you to do it. I prefer to do it on my own, as you know what I mean. I would like to quit the smoking. Not waste my time as I do it so often. I would like to improve my English and I would like to learn another language, Spanish or Italian. I would like to play the guitar properly. Do less watch TV and more read books. I have bad times and good times like everybody else. Zuzana: I have two little yellow-green and blue-green budgies, I call them both Pepik even if one is girl and one is boy (familiar name for birds here). They are my silly little birdies and they like to eat my plants all over my flat and it makes me angry. I also love cats, almost every cute animals except spiders. Ooough I really hate spiders.